Hibiscus is a gorgeous plant that sports huge, bell-shaped flowers. Though tropical types are typically grown indoors, hardy hibiscus plants make exceptional specimens in the garden. Wondering about the difference between hardy hibiscus and tropical hibiscus? Want to learn how to grow hibiscus outdoors in the garden? Read on. 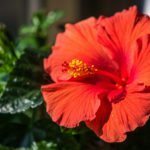 Although the flowers may be similar, hardy hibiscus plants are very different from the fussy, tropical hothouse plants available in floral shops and grown indoors. Hardy hibiscus is a non-tropical plant that tolerates punishing winters as far north as USDA plant hardiness zone 4 (with protection), while tropical hibiscus won’t survive outdoors north of zone 9. Tropical hibiscus is available in single or double blooms in colors that include salmon, peach, orange or yellow. On the other hand, hardy hibiscus plants comes in single forms only, with blooms of red, pink or white – often as large as dinner plates. Tropical hibiscus displays deep green, glossy leaves, while the heart-shaped leaves of hardy hibiscus are a duller shade of green. Hardy hibiscus plants are surprisingly easy to grow as long as you provide them with well-drained soil and a spot in full sunlight. The secret to success is to water enough to keep the soil evenly moist. This plant doesn’t absolutely require fertilizer, but a general-purpose fertilizer will promote vigorous growth and support blooming. Don’t worry if your hardy hibiscus plants die to the ground after a hard frost in autumn. Just cut them down to a height of 4 or 5 inches, and then wait for the plants to regrow from the roots in spring once temps begin to warm back up again. Don’t assume your plants have died if they don’t show up with the first hint of spring, as hardy hibiscus generally doesn’t make an appearance until May or June – then they catch up in a hurry with masses of blooms until fall.